Inspired from a traditional Puerto Rican comforting meat pie, this flavorful dish is filled with layers of melted VELVEETA, flavored meat and fried plantains. Heat dressing in large skillet on medium heat. Add plantains; cook 3 min. or until golden on both sides, turning after 1-1/2 min. Remove from skillet; set aside. Cook bacon, onions and peppers in same skillet 8 to 10 min. or just until bacon is crisp and vegetables are crisp-tender, stirring frequently. Add ground beef; cook 5 to 7 min. or until done, stirring frequently. Drain. Add all remaining ingredients except VELVEETA; cook on low heat 5 min. or until mixture is well blended, stirring frequently. Layer half each of the plantains, meat filling and VELVEETA in 8-inch square baking dish sprayed with cooking spray. Repeat layers. 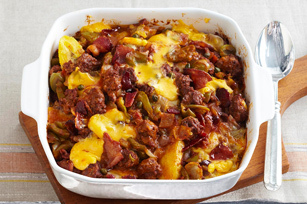 Enjoy one serving of this hearty entree on a cold winter night. Substitute 1 pkg. (8 oz.) KRAFT Shredded Cheddar Cheese for the cubed VELVEETA. Rinse whole plantains and peels under warm water to help remove the peels.